You’re looking at a box of colorful macarons on a park bench. They didn’t come from a fancy shop. Mais non, I made them. In Paris. And I may never make them again. They are as fussy to make as you might imagine, and now I know why they cost nearly $4 each at the Lâdurée store in New York. 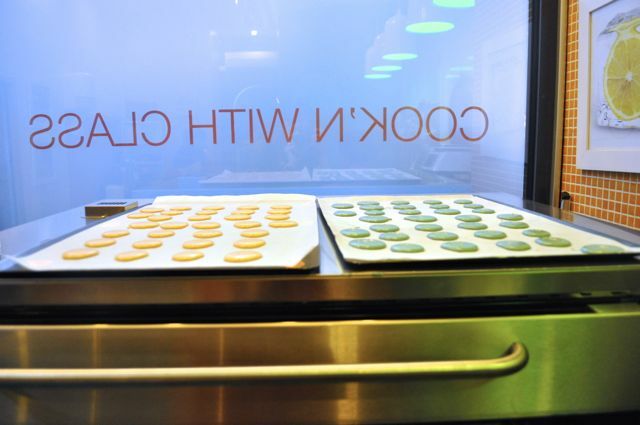 I signed up for a morning of macaron making at “Cook’n With Class,” a cooking school in Montmartre, only a couple of blocks from my friend’s apartment, where I was staying. 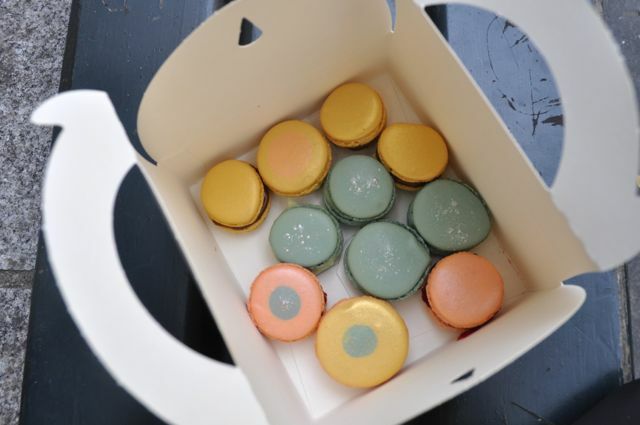 Macarons may actually be Italian by the way, not French, since some food historians believe that Catherine di Medici brought them to France as early as 1533. That’s when she married the man who would become the future King of France (Henry II), toting along her pastry chefs from Italy. It’s all still unsettled, but if the French want to claim macarons, that’s ok by me. Pretty as they are, they’re awfully sweet, and I’d much rather sink my teeth into some bonafide Italian biscotti any day. 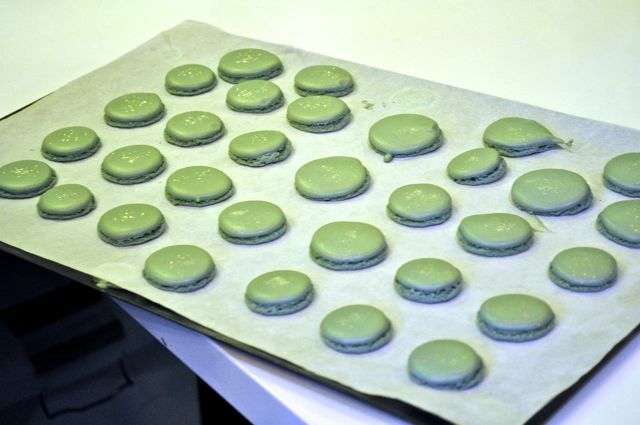 Still, I wanted to learn how to make these ethereal confections and why not from a Frenchman in Paris? 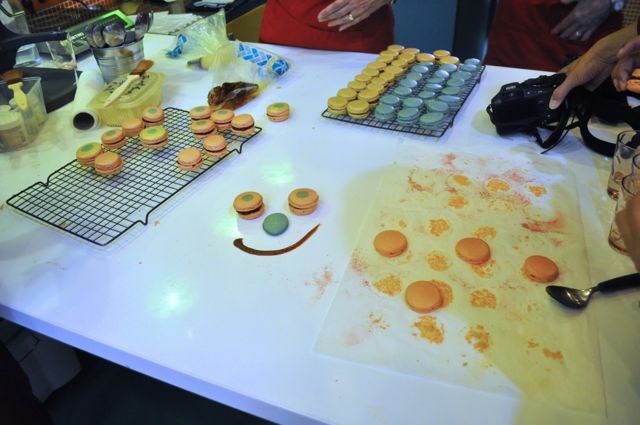 The chef, Patrick Hebert, spent many years working and living in the U.S., and he showed us how to make macarons with three different classic fillings: white chocolate, raspberry jam, and salted caramel. 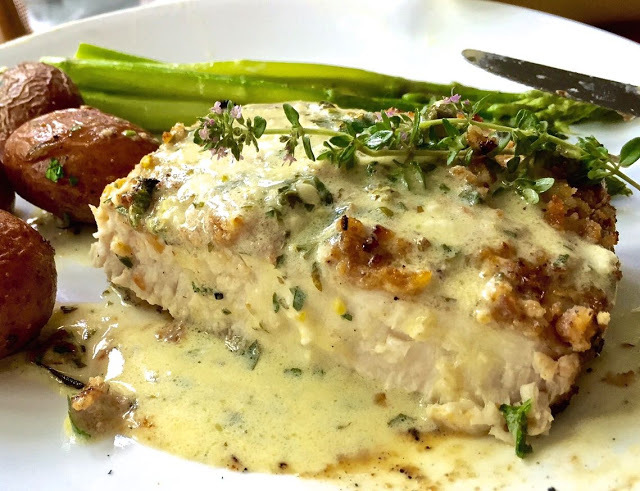 The fillings were made first. You’ll need a candy thermometer. Oh, and it’s best to make these on a day when it’s not raining or too humid. Don’t buy eggs from your local farmer and use them for macarons the same day. Older eggs work better. And you have to sift the powdered sugar and almond meal a couple of times so there aren’t any lumps. Every step is fraught with the prospect of failure. You’ve got to make a sugar syrup and let it reach a certain temperature before adding to the egg whites. 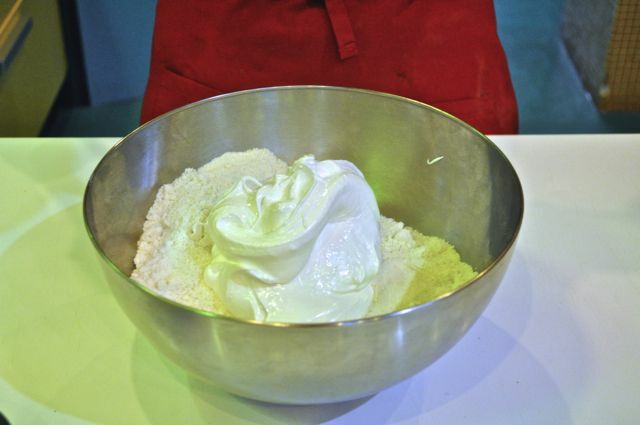 That’s in preparation for the Italian meringue (See… more evidence that macarons are really Italian!) Then you beat the egg whites until they reach a certain consistency and temperature. Mix the almond meal/sugar with the meringue. Then beat the crap out of it. That’s right, the whites are supposed to deflate at this point. Go figure. 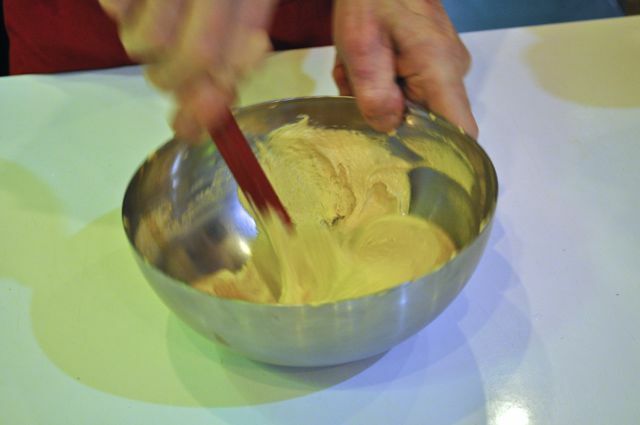 Food coloring gets blended in – not liquid, but powdered or gel. The flavor comes from the filling — not the actual cookie. The mixture is put into a pastry bag and piped onto parchment paper. Some experimenting was going on with some odd color combinations, as you can see. Before baking, you’ve got to leave them out at room temperature to form a “skin.” If you’ve got a warm place, like resting on an oven top, that’s good. Sometimes people use a blow dryer to reach this stage sooner. Once they go into the oven, you’re still not home free. You’ve got to open and close the oven door a couple of times to let the moisture escape – or keep the door ajar with a spoon. (I told you they were fussy to make.) But if you’ve taken all the proper steps, you’ll end up with nicely shaped cookies, like these. They’ve got the requisite “feet” all around the edges — de rigeur for a proper macaron. For a final touch, you can brush a little finishing powder on top to give a nice glisten. Then pipe the fillings onto one half and sandwich two of them together. And have a little fun while you’re at it. Note : A few days before preparing macarons, start saving egg whites, keep them refrigerated. 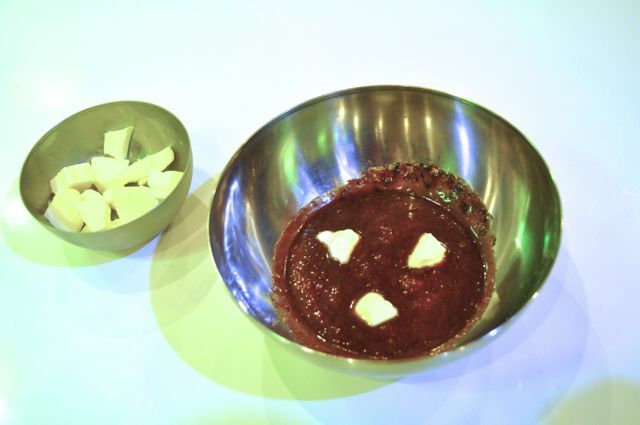 Strain the egg whites, weigh as indicated in each recipe and separate in two bowls. large bits of almond powder. Weigh and replace this with same amount of fine almond meal. Pour one quantity of egg whites (110g) in the sugar-almond mix, do not mix. 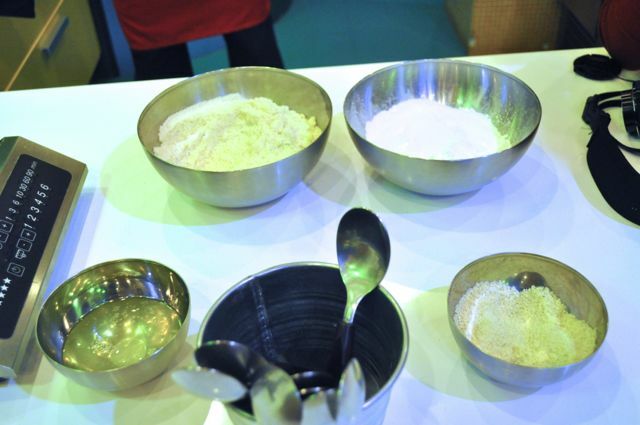 Weigh the sugar (plain white, not powdered) and water for the syrup. 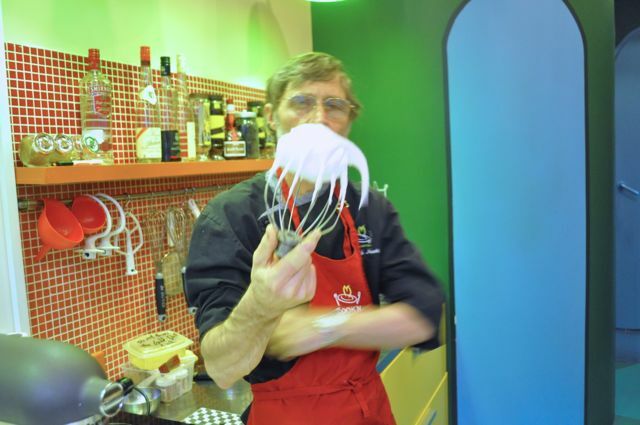 whipping the second bowl of egg whites (second quantity of egg whites – 110g). When the syrup reaches 115°C (239F) carefully pour it onto the whipping whites and keep going at high speed for about 1 minute. Mix the meringue into the sugar/almond/eggs mixture until the mix starts to be shiny. Don’t worry about saving the volume of the meringue, it is supposed to deflate at this stage. When shiny it is then ready. Mix the food colouring into the mixture. 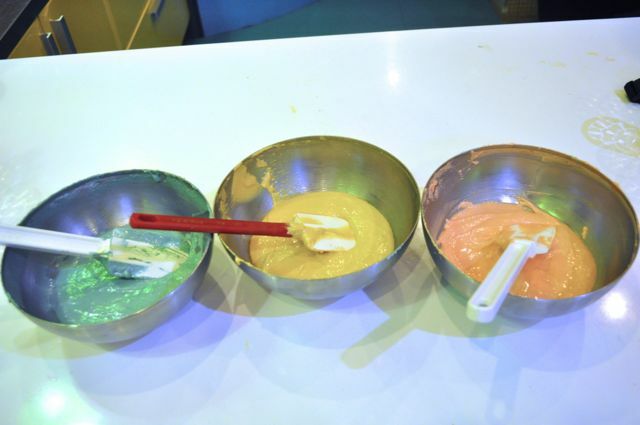 Use either powdered or gel food colouring but not liquid. Fill a pastry bag fitted with a round tip and pipe rounds on a parchment paper lined cookie sheet. (i.e. bumps) in your piped macaron. 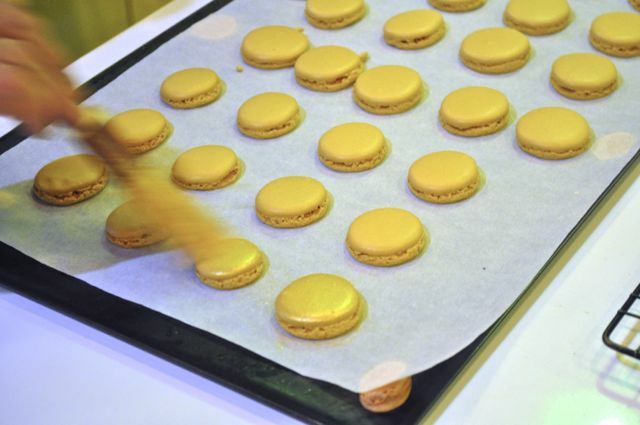 Leave the piped macarons at room temperature for about 30 minutes or until the macaron has formed a ‘skin’. the baking process or leave the oven door ajar with the help of a spoon. cooking. 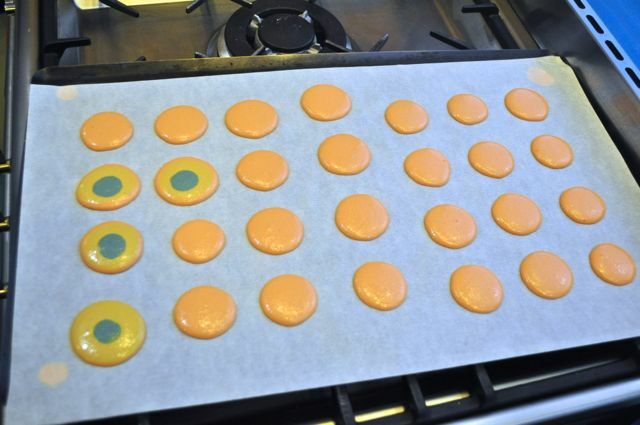 Let the macarons cool, then detach them from the paper one by one. Macaron shells tend to crack more if there is a lot of moisture in the air. So try and make them on a day when it’s not raining and not too humid. before filling a pastry bag to pipe the fillng in the macarons. 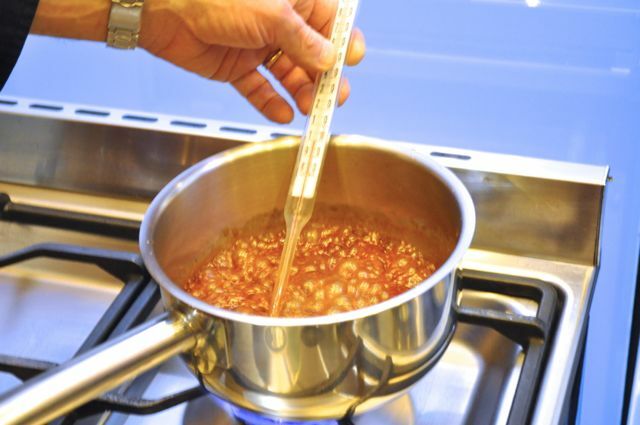 Make a dry caramel by melting the sugar one tablespoon at a time. Boil cream and pistachio. Then pour over chopped chocolate. They look beautiful! Well done. 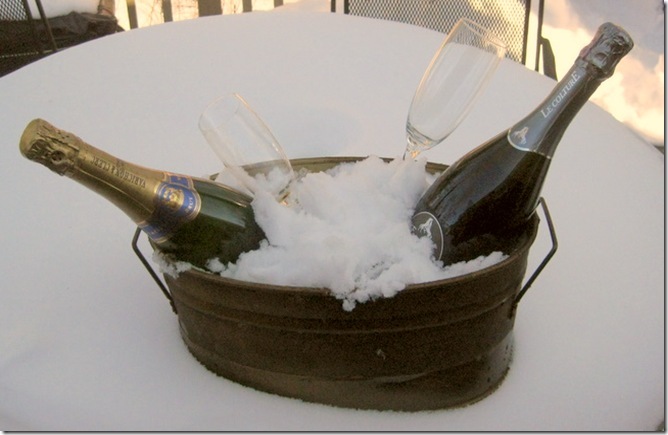 (I am giggling at the name "Cook'n with Class!"). What an experience to be in France learning how to make macarons,(even though they came from Italy, cough cough) but I don't think I would ever make them at home though, way too tedious for me, I'd be pulling my hair out, but I do love to eat them on occasion, love the colors and different varieties. Nothing else gives me the sense of accomplishment that I get when I take a sheet of macarons out of the oven and they have a nice domed top and proper little feet. I'm happy to know about this school. 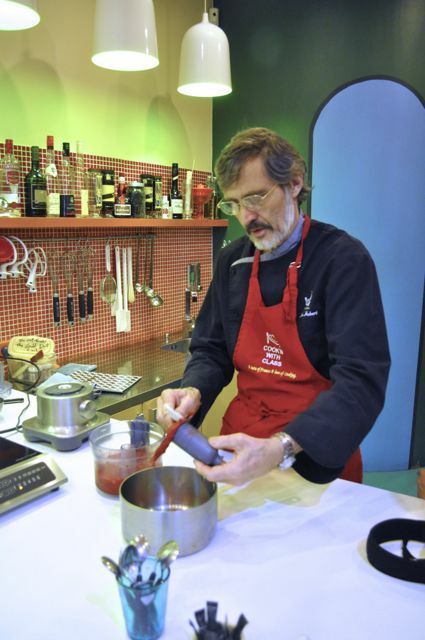 My daughter and I will be in Paris this spring and I would love to enroll us in a cooking class. Your macs are beautiful, Linda. Well done. I'm *really* impressed that you made these by hand! It's the kind of thing I wouldn't normally have the patience to do, I don't think. Plus, to be honest, like you I find macarons too sweet. Funny about the Catherine de' Medici story. You know, if you added up all the French dishes they say she brought from Italy, you'd think she had nothing else to do but cook—or rather order her cooks around! I've had Laduree's macaroons, and I agree they are very sweet. 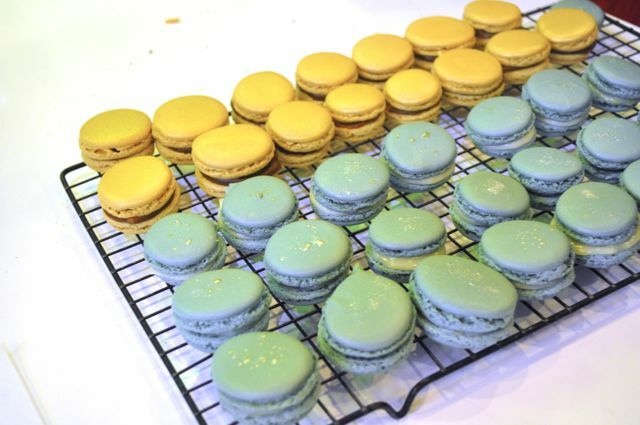 After seeing how much fuss macaroons take to make, I think I'll pass on attempting to make them…some things are best left to professionals 🙂 Non-the-less, it must have been fun to take this class in Paris! Consider me daunted. For four years I have considered making them (and I don't love them – but I love the idea of them). However, the pistachio filling makes me think, "Just once, Claudia,Just once!") And I love the idea of tackling something a tres difficile. And the looks of them. And thought of dreaming you're in France or Italy or elsewhere. Sometimes just being elsewhere is worth the difficulty. And sometimes – it brings you there. 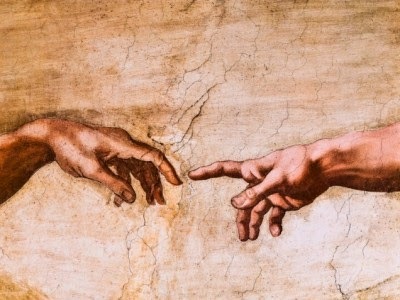 non so se sono così brava da farli in casa Linda, mi piacciono ma forse sono un pò troppo dolci per i miei gusti….Buona domenica, un abbraccio ! Non ho mai realizzato i macaron, questi sono una vera meraviglia, grazie per la dettagliata spiegazione. Un abbraccio, buona serata Daniela. Wow! A class looks really fun! And less stressful than trying to get it right many times at home… they are SO stressful to make, and they are awfully sweet… but I just can't help loving them! Hey, I found these macarons very realistic. Trying to make it at home after taking a macaron cooking course with Chef Fred at Le Foodist ( http://www.lefoodist.com ) but I'm not as successful as you are. Cheers anyway !